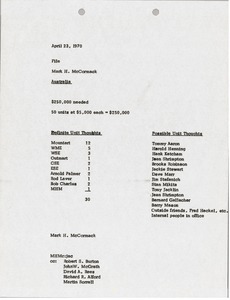 Australia - McCormack records notes regarding an investment project in Australia, including approximately how much money is needed, the number and cost of units, as well as lists of names for definite unit thoughts and possible unit thoughts. 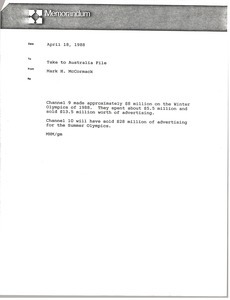 Australia - A series of lists conveying the current position on Nine Network major television championship rights in Australia. Championships include the U. S. Open (golf), the British Open, the World Match Play, Wimbledon, the U. S. Open (tennis), and the U. S. Masters (golf). 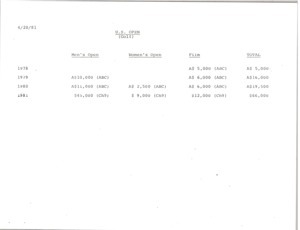 Australia - Concerning Channel 9 and Channel 10, and how much they spent and made on the Winter and Summer Olympics. 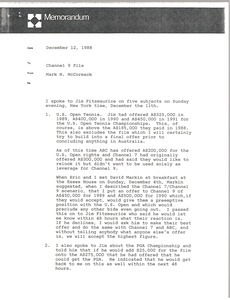 Australia - Notes from a meeting with Jim Fitzmaurice of Channel 9, concerning adding a film about the Masters to their proposal and thus increasing the offering price, as well as Channel 9's offer for the U.S. Open Tennis television rights. 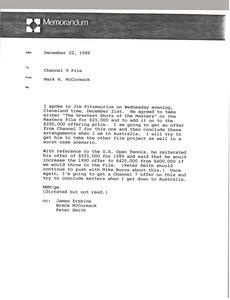 Australia - Notes from a meeting with Jim Fitzmaurice of Channel 9, concerning their offer on the U.S. Open Tennis Championship, the PGA Championship, offers from ABC Australia and Channel 9 for the Masters, the German Open Tennis Championship, and a potential Fred Stolle commentary contract.